Same screen layout as the exam for all clinical questions - "The closest to the real thing"
The complete online revision tool to help you prepare for the Multi Specialty Recruitment Assessment for GP, Radiology, Psychiatry, Ophthalmology and Obstetrics. There are currently over 2000 questions, to help you prepare for both papers in the Multi Specialty Recruitment Assessment as well as a study guide with advice on how to prepare. There is detailed feedback with each question so you can revise as you go along. There are questions of ALL the formats included in the exam. Single Best Answer (SBA) questions, and Extended Matching Questions (EMQs). Examples of some of the less common question types are included so you know what to expect (Multiple best answers, algorithm, fill in the blank). There are also 6 MINI MOCK EXAMS and 3 complete 100 question clinical MOCK EXAMS. Subjects are grouped by curriculum area to allow easy identification of your weaker areas. Each question comes with a detailed explanation, allowing you to revise important topics as you go. Practice questions for both section 1 and section 2 of this paper, with detailed answers and feedback. Tips on how to avoid common mistakes and a reading list for this paper are included in the study guide. 168 SJT scenarios, including a 58 Question TIMED FULL MOCK EXAM. This service has questions pitched at the same level and style as the real exam, to offer you the best preparation possible. 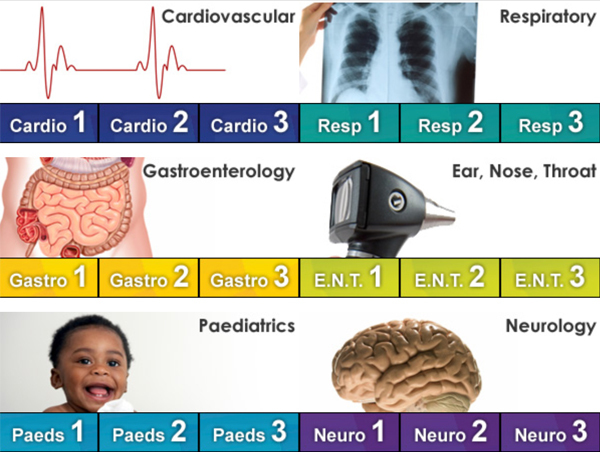 We also have more clinical questions in the current format than any other service! "I used Emedica to revise for the SRA and I managed to get a direct offer! The format of the clinical questions was very similar to the actual exam, which was really useful!" "During my preparation for SRA Exam, Emedica was an invaluable resource. The question bank was fantastic for preparing questions and assessing progress along with the mock examinations for timing practice. I attended the SRA crammer course which definitely helped with exam technique and further preparation required. I scored in the top 10% allowing direct entry into Psychiatry Training and Emedica was part of this success. Thank you for all the encouragement and help at such a crucial point in job application"
"Just wanted to say that I scored 550 in MSRA and was able to bypass the interview and get my first choice of SLAM! Many thanks for your help, really enjoyed the course and the online modules were well designed. Also appreciate the responsiveness of your whole team to questions by email." "Thank you for your support with my MSRA exam. I used your emedica resource in conjunction with passmedicine and successfully received a direct offer to GP training, so thank you very much for your help!" "I would like to thank you for your excellent presentation (I followed the webinar in Birmingham) on the MSRA; the Professional Dilemmas section was particularly helpful in demystifying the questions and giving us a framework for answering. Your workshop almost certainly played a part in helping me to secure a Direct Pathway to Offer for the GP training scheme. I am thrilled, and wanted to thank you for your very clear and informative presentation! I will definitely be recommending Emedica for any of my friends or colleagues revising for the exam." "Thank you for your emails. I'm sorry I meant to get in contact with you earlier to let you know I scored 610 (Band 4 in both papers) in the stage 2 this year, so qualified for the Direct Offers Pathway! Your stage 2 online revision is fantastic and has a very similar question format (including phrasing) to the actual exam." "Thank you very much Dr Rahman. I got my first choice. Emedica aims to make the candidate perfect." "Thank you for all the updates and encouraging emails. I have been invited to interview and I know I would not have done as I did in the MSRA without the emedica questions and crammer course. Thank you also for all the tips about when to book/the whole process, I have not felt on my own through it all." "It was beneficial in teaching the technique to passing exams with high scoring marks." "I used the Emedica online courses and got my first pick scheme! I scored highly in the SRA and in the interview. The online courses were perfect for preparing for what was required. I would highly recommend to others." "Comprehensive online revision, well worth the money. Advise and revision notes provided in short bursts which helps with retention of information. I would definitely recommend Emedica". "With regards to Emedica, I thought it was excellent and prepared me really well. It was the only question bank that I felt truly reflected the stage 2 exam, with detailed enough and succinct enough explanations, allowing one to practice a great volume of questions, of particularly high quality. I am definitely going to use your question bank for my further exams. Many thanks for your help and I will definitely recommend this bank to my colleagues"
Excellent tips obtained at the revision courses. I found the online revision more like the actual stage 2 exam than other online revision resources. Emedica was a vital aspect of my preparation towards the GPST entry exams and in securing my first choice trust! The online stage 2 revision was structured in a way that allowed to me easily slot revision in around my busy schedule and contained sufficient information. "The stage 2 online revision subscription was useful. It was at the appropriate level and reflective of the style and content of the actual exam." "I used the online revision for both stage 2 and 3 and managed to get in to one of my top 5 choices. The questions were helpful for stage 2 as it allowed me to master exam technique as well as identify my weak areas and learn while I worked my way through the questions.....I would highly recommend using Emedica if you are thinking of applying for GP!" "Excellent courses for stage 2 and 3, with the additional online revision. They really helped me get my first choice. Thank you"
"This year I used stage 2 online revision questions which were pitched at the right level and very useful. I gained a place in my first choice deanery." "Very useful in preparing for Stage 2 instead of reading textbooks. Allowed for focussed examination preparation. Easy to navigate and I liked the separation into different specialities so I could see where my gaps were." "I found the online resources highly useful, it gave me plenty of opportunity to practice at my own place and in my own time and has played a huge part in being offered a place in GP training. 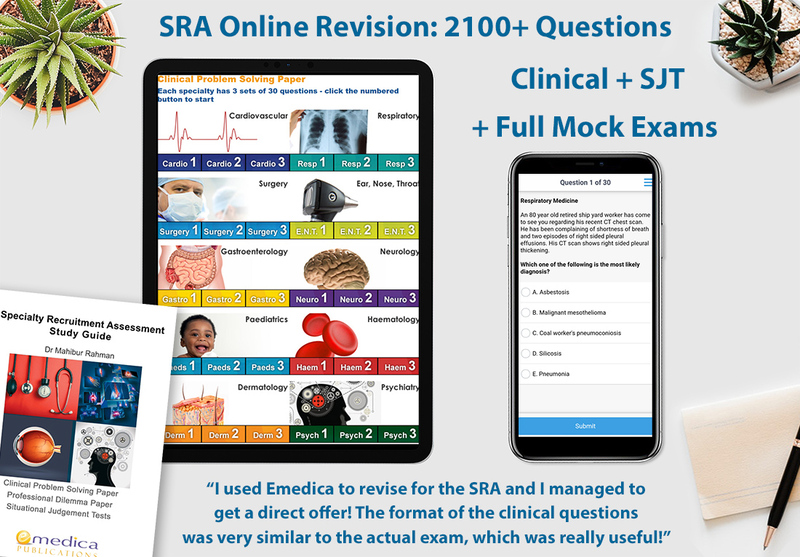 Thank you"
"Found the Stage 2 online revision very useful in revising adult medicine and felt it was of an appropriate difficulty and similar questions to those in the actual exam. The Stage 3 assessment course was very useful in understanding exactly what they were looking for on the assessment day - I only wish I'd gone to an earlier course so I could have practised the written part more. Having said that I got my first choice county within my first choice deanery so very happy." "It was a useful revision tool! Recommend to everyone. Many thanks to Dr Rahman and his efforts." "I secured a post for Broad Based Training for Wessex Deanery. Hopefully in 4 years' time now I will be a GP. I loved the Emedica courses and online revision. Thank you again for all the help." Highly professional website. Very useful guides to applications and kind reminders via email during key application dates. I enrolled in both of the Stage 2 and 3 online courses and went to the day courses for both stages. I found all of the input I received extremely helpful in achieving my first choice. The stage 3 assessment course was enjoyable and encouraging- it built up my confidence and was a vital factor for me performing well on the day. "Your Stage 2 online course and the Stage3 course helped me to prepare for the exam as well as know what is expected. Thanks to the Emedica team."